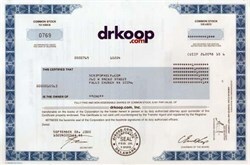 Beautifully engraved Certificate from the famous DrKoop.com issued in September 2000 prior to the company being delisted in 2001 from the NASDAQ National Market. This historic document was printed by the Northern Banknote Company and has an ornate border around it with a vignette of DrKoop.com. This item has the printed signature of the famous Dr. C. Everett Koop. drkoop.com was a leading global healthcare Network providing measurable value to individuals worldwide. Its mission was to empower consumers with the information and resources they need to become active participants in the management of their own health. On July 15, 2002 DrKoop.com was bought by Vitacost.com, a seller of health-related products over the Internet, for $186,000. At one time DrKoop.com was worth more than $1 billion based on its market cap. Vitacost paid $186,000 in cash for DrKoop.com's assets, which included the brand name, trademarks, domain names, the Web site, and the e-mail addresses of its registered users. DrKoop.com became a case-study for the roller-coaster ride of the dot-com era. Unveiled with a splash as Empower Health, the company sank into a cash crisis barely a year later, only to find an angel investor who provided enough backing until the company could sell itself to the public in 1999 as DrKoop.com. Dr. Koop Online Web Site to File for Bankruptcy and Close Dec. 18, 2001--Dr. Koop LifeCare Corp., which operates the health-care information Web site named after the former U.S. surgeon general, said Monday it will file for Chapter 7 bankruptcy and go out of business. The company said it will ask a court-appointed trustee to sell its assets to satisfy creditors. Shareholders, who have seen the value of the stock plunge from $45 soon after it went public to pennies per share before it was delisted earlier this year, will likely not receive anything, the company said. Jan Rumberger, a midstate venture capitalist, has said he had a role in the founding of what formerly was known as drkoop.com Inc.
Rumberger had hoped the company would be based in the Harrisburg area, but the headquarters ended up in Austin, Texas, and then Santa Monica, Calif. He could not be reached for comment Monday. Highmark Inc., which operates in the midstate as Pennsylvania Blue Shield, and the Lancaster Health Alliance, which includes Lancaster General Hospital, were participants in Dr. Koop LifeCare's Community Partner Program, which created co-branded Web sites offering health-care and lifestyle information. The Highmark relationship was among several highlighted in disclosure documents filed before a public stock offering by drkoop.com in June 1999. Keith Eckert, a spokesman for Highmark, said drkoop.com material was offered to Highmark's western Pennsylvania subscribers, who needed a password to gain access. Highmark purchased the service from Dr. Koop LifeCare, he said, but was planning to drop the service when the current contract expired. Dr. C. Everett Koop, 85, was U.S. surgeon general in the Reagan administration and was often in the public eye from 1981 to 1989. According to an article published last year in the Industry Standard, Koop was recruited to the startup company because of the trust and brand value associated with his name. He was chairman of the company and a major stockholder -- he holds about 1.8 million shares, according to Bloomberg News -- but reportedly had few day-to-day responsibilities. Originally called Personal Medical Records Inc. and later renamed Empower Health Corp., the company was incorporated in Austin, Texas, in July 1997. Its initial goal was to develop software that would enable the full medical and insurance records of people to be accessed online throughout their lives, still an unrealized goal of the health-care industry. The Personal Medical Record originally was to be a free-standing product, according to the drkoop.com proxy statement, but the company's leaders later decided it should be part of an Internet Web site that also offered health-care information, disease chat rooms and other useful tools. The company licensed Koop's name in January 1999 in return for 2 percent to 4 percent of revenues and changed the company's name once again. In its final, yearlong death throes, drkoop.com became emblematic of Internet companies that went public with high hopes, the best of intentions and unrealistic business plans. The drkoop.com Network was built from relationships with other Web sites, healthcare portals and traditional media outlets, and integrates dynamic, medically reviewed content, interactive communities and consumer-focused tools into a complete source of trusted healthcare information. Its strategic alliance with Shared Medical Systems (SMS) makes drkoop.com a leader in promoting secure online interaction between patients, insurance companies, physicians and healthcare organizations. With more than 1.4 million registered users worldwide, drkoop.com has strategic relationships with online organizations. The Company's content was also featured on the Web sites of more than 420 healthcare facilities and more than 20 leading television stations nationwide. In August 2000 the company received a $27.5 million cash infusion and a new management team aiming to save the ailing company. In September 2000, the new management team fired about one-third of the staff in a cost cutting restructuring. Even though Drkoop.com received an equity financing, the health Web site stock was on the brink of failure down from its time high of $45.75. Drkoop.com reported the SEC is conducting an informal investigation into whether the company violated securities laws. Drkoop also is the target of several class-action lawsuits. Regardless what ends up happening to DrKoop.com, these certificates will always be a reminder of the dot com mania over the last several years. 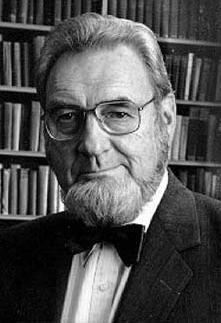 Dr. C. Everett Koop was born in Brooklyn, New York, on October 14, 1916. He graduated from Dartmouth College in 1937 and received his M.D. degree from Cornell Medical College in 1941. After serving an internship at the Pennsylvania Hospital, he pursued postgraduate training at the University of Pennsylvania School of Medicine, the Boston Children's Hospital, and the Graduate School of Medicine at the University of Pennsylvania, where he received the degree of Doctor of Science (Medicine) in 1947. After a series of promotions, he was named Professor of Pediatric Surgery at the School of Medicine of the University of Pennsylvania in 1959, and later Professor of Pediatrics in 1971. He is presently the Elizabeth DeCamp McInerny Professor at Dartmouth. An internationally respected pediatric surgeon, Dr. Koop became Surgeon-in-Chief of the Children's Hospital of Philadelphia in 1948 and served in that capacity until he left the academic world in 1981. He was the Editor-in-Chief of the Journal of Pediatric Surgery from 1964-1976. Dr. Koop was appointed Deputy Assistant Secretary for Health, U.S. Public Health Service (PHS) in March 1981 and was sworn in as the U.S. Surgeon General on November 17, 1981. He was also appointed Director of the Office of International Health in May 1982. As Surgeon General, Dr. Koop oversaw the activities of the 6,000 member PHS Commissioned Corps and advised the public on a variety of health matters: smoking and health, diet and nutrition, environmental health hazards, and the importance of immunization and disease prevention. He also became the government's chief spokesman on AIDS. He resigned as Surgeon General on October 1, 1989 and continues to be a force for public health and health education through his writings, electronic media, public appearances, personal contacts, and as Senior Scholar of the C. Everett Koop Institute at Dartmouth. Dr. Koop was awarded the Denis Brown Gold Medal by the British Association of Paediatric Surgeons; the William E. Ladd Gold Medal of the American Academy of Pediatrics in recognition of outstanding contributions to the field of pediatric surgery; the Order of the Duarte, Sanchez, and Mella (the highest award of the Dominican Republic) for his achievement in separating the conjoined Dominican twins; and a number of other awards from civic, religious, medical and philanthropic organizations. He was awarded the Medal of the Legion of Honor by the government of France in 1980, was inducted into the Royal College of Surgeons of England in 1982 as well as the Royal College of Physicians and Surgeons of Glasgow in 1987. In May 1983, Dr. Koop was awarded the Public Health Service Distinguished Service Medal in recognition of his extraordinary leadership of the U.S. Public Health Service. After his retirement, he was presented with the Surgeon General's Exemplary Service Medal and the Surgeon General's Medallion. In September of 1995, President Clinton presented him with the Presidential Medal of Freedom, the nation's highest civilian award. Dr. Koop is a member of the American Surgical Association, the Society of University Surgeons, the American Pediatric Surgical Association, the National Academy of Sciences, the Institute of Medicine, the American Philosophical Society, and a number of other professional societies in the U.S. and abroad. He is a Fellow of the American College of Surgeons and the American Academy of Pediatrics, the Society of Behavioral Medicine, and a member of the American College of Preventive Medicine. Dr. Koop is Chairman of the Board of Trustees of the National Museum of Health and Medicine Foundation, Chairman of the National SAFE KIDS Campaign, Honorary Chairman of The Health Project, a Director of the Biopure Corporation and Chairman of its Scientific Advisory Board. He is on the Board of Directors of the National HealthNetwork, the Foundation for Biomedical Research, A.D.A.M. Software, Inc., and is an advisor to Neurocrine Biosciences, Inc. and International Aid Inc. He serves as an international advisor to AIDS Care Education and Training (United Kingdom) and is a member of the National Advisory Boards of the International Health and Medical Film Festival, Inc., and the Texas Heart Institute. He has written more than 200 articles and books on the practice of medicine and surgery, biomedical ethics, and health policy. In 1991 he was given an Emmy Award in the News and Documentary category for C. Everett Koop, M.D., a five part series on health care reform. Two of the shows in this series were awarded Freddies in 1992: Best Film in the Category of Aging for Forever Young and Best Film in the Category of Family Dynamics for Listening to Teenagers.